"Don't tell me what to do! You don't know me, you don't know anything. You just found me here, now move along and mind your own business, this is not your business." He stands on the edge of a building overlooking the lights of a city that promised him something new and wonderful, but delivered only the ugly truth about himself. He was going to have to be him, no matter where he lived. "I am not telling you what to do. I am telling you what I would do. I would just jump. Just go. You took 100 flights of stairs to get here because the elevator is broken, why not jump?" "I can't right now. I need you to go. I don't want anyone to see. I want to be alone." "I was up here once you know. You aren't the first person to step on this exact ledge in the night while happy people are sleeping. I was here once in this exact same spot...only ten years ago. I came here to celebrate the night everything changed. I was not you, I was me in your shoes and I stepped off that very small piece of concrete you stand on now. I just did it. I stepped off and I fell down. At first I thought I was still falling, but really I had fallen on something hard hanging over the sky, invisible to my eyes. I stepped on it many times and jumped on it, hoping it would break like glass but nothing happened, even when I had walked clear across these buildings. Someone was telling me that I had no choice, I was going to understand love, no matter how hard I resisted." "I am not messing with you. I am not crying for help. I had no idea anyone would be here. Tonight is the night, just go away and leave me be. I didn't ask you to be here." "Then jump. But before you do, understand that there is more to life than what you see in front of your eyes. There is much more. Before you go I want to show you something." He closes his eyes and pauses for a moment and walks to the ledge and steps off without hesitation, devoting his body weight to gravity. Gravity failed. He steps his foot down on the surface of something unseen and takes another. He walks ten feet into the night then turns around and holds out his hand toward the man on the ledge. Perplexed, clearly, He says "How are you doing this?" An understandable and fair question to ask at this point in time. "Step off man. There is this story in the Bible where Peter was in a boat in the middle of the night and Jesus came walking on the water during a terrifying storm and tells Peter to step out of the boat. Peter does and begins walking on the water just like Jesus. Peter starts looking around and takes his eyes of Jesus and gets scared looking at the waves and storm and starts to sink. Jesus reaches down and grabs his hand and pulls him from the abyss. It takes faith to see God ruling in your life. It takes faith to know that you aren't in control of the waves and lightning, but God is. 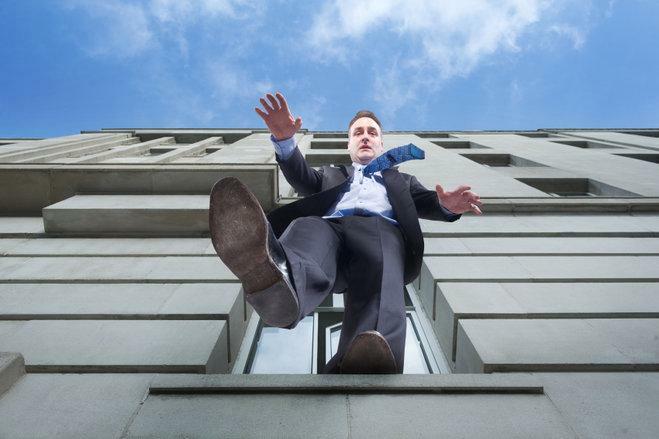 You can step off that ledge and be assured that you will fall 100 stories and die, or you can step off in faith and grab my hand knowing that God is the floor beneath you. Or...you can turn around and walk away and end up here again in a month. I say take my hand." "You think Peter wasn't scared when he stepped out of the boat? He was terrified, but faith is not about knowing you are in the hands of God and walking without doubt. Faith is still stepping off despite the doubt. Take my my hand out here, knowing you are taking His. " His hands shake and shiver on the roof that may change his life. He looks up in tears at the sky...at the God he has doubted his entire life. He has no choice now. He came all the way here and walked 100 floors x10 steps each. He had to trust because he had nothing else to lose. He steps off with his eyes closed and his hands shaking and finds the floor. He opens his eyes and looks down at the street full of moving cars a thousand feet below. He begins to laugh. Even he has no idea why he reacts this way... it is surely inappropriate for the moment, but he cannot help it, so he gives in and just stands there on air laughing while tears flow down his face. "Didn't I tell you not to jump? Didn't I tell you that it was what I would do? Why did you jump?" "I had no choice. I have nothing left, now I feel stupid, as if I have everything and almost left it. I had built a fortress and vowed to never leave this place...this hopeless place. So I stepped off, begging there to be something out there that cared and here I am standing on nothing." "Then I guess you know now."